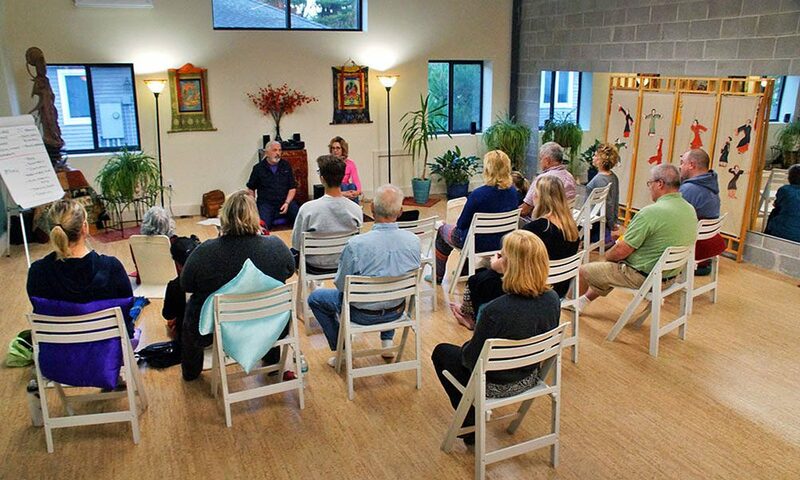 saratoga living takes an eight-week program at local meditation center, One Big Roof. Meditation is the basis of the eight-week Stress Reduction Program at One Big Roof in Saratoga, which is taught by Selma Nemer, Caroline Russell Smith and Pierre Zimmerman. The 50th program ended last November, and graduates of all the stress-reduction classes, myself included, were invited to the “50th Mindfulness Practices Celebration” this past January. The course is modeled on the one originated by Jon Kabat-Zinn, who, in the 1990s, helped pioneer a movement to bring mindfulness to the masses as a scientifically researched healing practice. Nemer, a clinical psychologist, and Smith, who has a private psychotherapy practice in town, teamed up in ’05 to bring the practice to Saratoga. One Big Roof, a retreat and workshop center on Maple Avenue, is part of One Roof, a holistic health center on Henry Street that was founded by Nemer. At first, Smith thought that mindfulness would only be another tool to offer her patients, but the “be here now” techniques that she learned were life changing for her as well. The mindfulness meditation practice is a different approach to supporting mental health, she says, or “just dealing with the struggle of being human.” Smith cites the example of a woman who came into the program with chronic pain. When classes ended eight weeks later, the woman reported that her level on the pain scale had dropped from a “10” to a “4.” “It gave her a sense that the pain wasn’t happening to her; it gave her a sense of agency,” Smith says. In my Saturday morning class, someone asked Zimmerman if meditation was the same as focusing. “Focusing can be what we do in our daily lives, while we are working or driving; concentrating on the tasks we do in the world,” he says. “With meditation, we are ‘dropping in’ instead, focusing on our breath.” After class, I asked Zimmerman about the statue. “That’s Kuan Yin, the embodiment of compassion. She was my woman for five years, before I met Selma,” he says, jokingly, of his companion in life. Smith introduced the two of them 11 years ago at a silent retreat at Upaya Zen Center in New Mexico. Nemer is the former chef-owner of Eartha’s Kitchen, a Saratoga restaurant that she ran while raising two children. In 2005, she founded One Roof. The restored, classic wooden house on Henry Street, a former gospel church seminary and shelter, provides spaces where mind-body practitioners share the same goal: to treat the whole person. Psychotherapists, reiki practitioners, massage therapists, acupuncturists and other healers treat anxiety, chronic pain, weight and body issues and hypertension. Zimmerman is a Buddhist chaplain who serves people with catastrophic illnesses. After working 25 years in corporate healthcare, he found a higher calling in ministering to people with cancer or who are close to the end of life. He offers workshops at Saratoga Hospital, as well as at a site in Massachusetts. During the fourth Saturday class, Zimmerman invited the group—one by one—to report on their homework from the previous week, which was, in addition to meditation practice, taking special note of a pleasant experience. Someone reported savoring a moment of joy he experienced while running. One woman recounted the peace she felt in taking the time to appreciate a glowing sunset over a lake. A man shared that the meditation practice allowed him to simply weep, and that release itself was a sort of joy. As finding balance in our daily lives is one of the themes of this course, Nemer gave us new homework for the upcoming week: noticing an unpleasant experience. “But that is in addition to noticing any pleasant experiences,” she said with a smile. The two stress-reduction classes gathered together last November for a mostly silent retreat at One Big Roof. Students were guided through silent and moving meditations, including some gentle yoga, before feasting on a vegetarian potluck…silently, of course. After lunch, meditators engaged in interactive moving exercises, with the phenomenon of sound slowly—and playfully—reintroduced. Finally, the 38 graduates gathered in a circle to share what the experience meant—not without a few tears. The teachers shared as well: Smith rejoiced at this 50th completed OBR Stress Reduction Course. At that moment, the closing lyrics to Arlo Guthrie’s “Alice’s Restaurant” came to mind: “Friends, they may think this is a movement—and that’s what it is!” A no-fear movement.